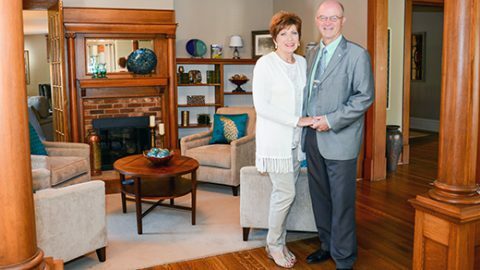 On behalf of Upper Iowa University, President William R. Duffy and his wife, Sharon, will host an open house of the newly renovated President’s Home on Friday, October 7. The event is among the many special festivities planned during the University’s “Blue Pride Worldwide” 100th Homecoming celebration October 6-8. After two years of renovations, the doors to the Upper Iowa University (UIU) President’s Home in Fayette will once again be open to the Peacock community. On behalf of UIU, President William R. Duffy and his wife, Sharon, will celebrate the occasion by hosting an open house during the University’s “Blue Pride Worldwide” 100th Homecoming on Friday, October 7. The President’s Home, located across from Fayette Campus at 308 Washington St., has served as home to University presidents and their families since 1900. In those nearly 120 years, it also has accommodated a large number of dignitaries, guests, and special events. To ensure the President’s Home is around for many years to come, a renovation project commenced in 2015. Each room in the house underwent some type of transformation or improvement, including fresh coats of paint, refinished wood floors, installation of new cabinetry, and the addition of an HVAC system. All of this was made possible with over $100,000 in donations. The President’s Home Open House will be held from 12:30 – 3:30 p.m. Friday, October 7. In addition to touring the home, visitors will enjoy desserts and refreshments. Meanwhile, another UIU landmark will be open to the public for the last time on Friday, October7. The UIU Board of Trustees earlier announced its decision to close Colgrove-Walker Hall at Fayette campus. The building needed extensive and costly repairs if it were to remain in operation. Homecoming visitors are invited to participate in a special tour of Colgrove-Walker Hall from 11 a.m. – noon. Those wishing to attend are asked to use the southeast entrance (closest to Parker-Fox Hall). The official “Blue Pride Worldwide” festivities begin with the annual pep rally, bonfire, and coronation of the Homecoming King and Queen at 7:30 p.m. on Thursday, October 6. After touring Colgrove-Walker Hall and the President’s House on October 7, the Peacock community is invited to the special “Heartland” reception from 2:30 -4:30 p.m. at Bing-Davis Memorial Gallery. The exhibit will feature landscape paintings created by alumnus Mark Haltof ’71, who served as an artist-in-residence at Fayette Campus last fall. Meanwhile, the UIU women’s soccer team will take to Pattison Field against Southwest Minnesota State at 3 p.m., and the annual President’s Ball is scheduled to follow at 6 p.m. in the Student Center Ballroom. The President’s Ball serves as the University’s premiere fundraiser event and directly benefits students. Alumni are reminded to RSVP by contacting the Alumni Office at 563-425-5388 or alumni@uiu.edu. Grand marshal and UIU alumnus Vince Popolizio ’63 will lead the traditional Homecoming parade in downtown Fayette at 10 a.m. on Saturday, October 8. Registration follows at 11:30 a.m. for the Alumni Awards and Honor Class Luncheon in the Student Center Ballroom. The lunch program is scheduled to begin at noon. RSVP is required. The UIU Homecoming football game will kick off at 2 p.m., with the Peacocks slated to play Winona State at Harms-Eischeid Stadium. The 100th Homecoming celebration concludes with the Athletic Hall of Fame Banquet at 6 p.m. in the Student Center Ballroom. The entire Peacock community is reminded to visit the University Archives, located in Henderson-Wilder Library, throughout the “Blue Pride Worldwide” Homecoming celebration. During their visit to the Archives, alumni and other guests are also invited to participate in the Oral History Project. As part of the interactive exhibit, visitors may record their own story to become part of the collection or view previously recorded alumni stories. An additional exhibit dedicated to 100 years of UIU Homecomings will be located in the Student Center.